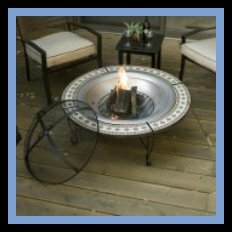 Wood Burning Heaters or Fire Pits not only add a lot of warmth, but they are nice looking too. They will last for many years. There are a lot of good qualities about the wood burning heaters. One of my favorites is the aroma of the burning wood, not to mention the charm. I know that a wood burning fireplace is a little more trouble to get started and that the smoke can be bothersome at times, but there is just something about a wood burning fireplace that conjures up memories or my past. Can you tell I am a little bias? The wood burning heaters of today have so much style and are enclosed to keep the embers from flying out. They are funtional too. Many styles come with racks that you can use for grilling your favorite burger. 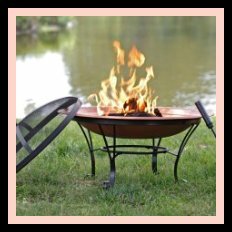 The fire pits are durable, weather resistant, and add that decorative touch that makes your garden beautiful. 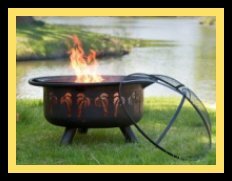 The "Chimineas" are very nice too and are one of the most popular of the wood burning heaters. They sometimes have patterns that include dragonflies, hummingbirds, butterflies, and frogs, just to name a few. Some chimineas have a 360 degree view of their firebox and others have doors on the front. They stand high off the ground to prevent any damage to your patio or deck. 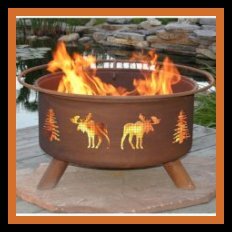 The web sites on this page have great selections of fire pits and other outdoor heaters. Check them out. I'm sure you will find something you just can't live without. The first morning of the season that you go outside and light up that first fire, you can sit back and enjoy the warmth and the aroma of the burning wood. You sip on that fresh cup of coffee, and you will wonder, "why did I wait so long to get one.